Although the small pinkish white lily of the valley flowers are a real attraction in spring, Pieris japonica ‘Katsura’ has added attractions. Glossy green foliage right through the year including winter and spring, make this a great evergreen plant. The flowers take in spring and then the new growth from spring through summer puts on another show. It is however, the brilliant red new growth that make this such a valuable plant for the garden. It adds colour to a part shaded position, and is very easy to grow. 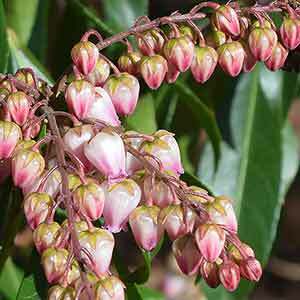 Pieris are known as the Japanese Andromeda and this particular variety was bred in Japan. 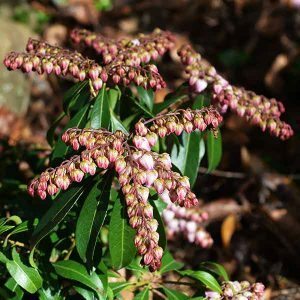 Like all Pieris, it does prefer a slightly acidic soil, this makes it a great foil for planting along with Camellias and Rhododendrons. After planting it is only fertiliser and mulch that is required for regular maintenance. The best fertiliser will be a camellia and azalea type. Light mulch around the plant will suppress any weeds and maintain a cool root run. Pruning is generally not required, although Pieris japonica ‘Katsura’ is easily pruned if you require a lower growing plant. If you are going to prune these plants, do it in late spring. Always prune back to a set of healthy leaves, never into bare wood. In a Japanese style garden this make a brilliant background plant as well as a feature plant. You could grow Pieris ‘Katsura’ in an old stone pot to great effect. You can grow it as a stand alone plant, or mass plant it in a shaded position. Position – Part shade isn the best position. Growth rate – Medium to slow depending on soil and climate. Growth habit – Upright with a rounded shape. Height – To 1.5 metres over time. Spread – To 1.5 metres. Flowers – Rich pink from deeper red buds. Foliage – Mid to deep green with strong flushers of red in new growth. Readily available for sale at good nurseries.